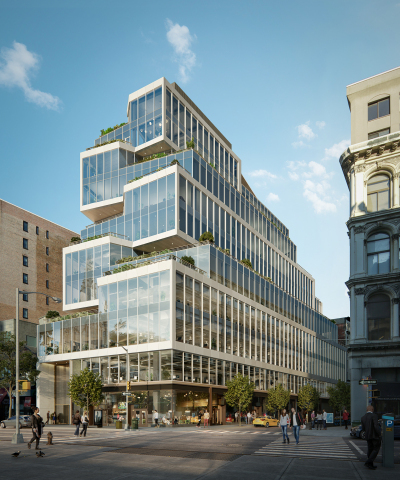 NEW YORK--(BUSINESS WIRE)-- Columbia Property Trust, Inc. (NYSE: CXP) has entered into an agreement to form a joint venture with Normandy Real Estate Partners LLC to jointly develop 799 Broadway in Manhattan’s Midtown South. Columbia will own a 50 percent interest in this $300 million ground-up project, which is scheduled to be completed in the second half of 2020. 799 Broadway is located at the corner of 11th Street and Broadway, at the convergence of Union Square and Greenwich Village. Designed by Perkins+Will, the new 12-story, loft-style building will comprise 182,000 square feet of boutique office space and will provide a dramatic complement to this quintessential New York neighborhood. With floor plates ranging from 3,600 to 22,000 square feet, 799 Broadway will feature floor-to-ceiling glass, private terraces, and 15 foot high ceilings. This combination of highly desirable location and state-of-the-art design will appeal to New York’s most progressive and creative companies. Once completed, 799 Broadway will complement Columbia’s growing portfolio of differentiated assets in Midtown South, characterized by smaller floor plates, distinctive architecture, and high-end, modern finishes and amenities. Columbia’s Manhattan portfolio also includes 218 West 18th Street, 249 West 17th Street, 114 Fifth Avenue, 229 West 43rd Street, 315 Park Avenue South, and 149 Madison Avenue. Columbia Property Trust (NYSE: CXP) owns and operates Class-A office buildings concentrated in New York, San Francisco, and Washington, D.C. Its portfolio includes 19 properties with approximately nine million rentable square feet and one property under contract. Columbia carries an investment-grade rating from both Moody’s and Standard & Poor’s. For more information, please visit www.columbia.reit. Normandy Real Estate Partners is a leading real estate investment management firm and operator with offices in New York City, Boston, Washington, D.C. and New Jersey, with a track record spanning 20 years. The firm is a vertically-integrated investment and operating platform with broad real estate experience in areas such as acquisitions, investment management, leasing, property management and construction/development. Its focus is primarily on acquiring office and mixed-use investments located in the Northeast and Mid-Atlantic CBD and transit-oriented submarkets where the firm owns and operates one of the largest private real estate portfolios in the region, totaling over 14 million square feet and a development pipeline of four million square feet. Normandy’s deep local relationships, vertically-integrated capabilities, and diversely-experienced team give it a distinct advantage, which enables it to consistently turn under-achieving real estate into exceptional high-yielding investments. For more information visit www.normandyrealty.com. Certain statements contained in this press release other than historical facts may be considered forward-looking statements within the meaning of Section 27A of the Securities Act of 1933 and Section 21E of the Securities Exchange Act of 1934. We intend for all such forward-looking statements to be covered by the applicable safe harbor provisions for forward-looking statements contained in those acts. Such statements include, in particular, statements about our development plans and joint venture strategies and are subject to certain risks and uncertainties, including known and unknown risks, which could cause actual results to differ materially from those projected or anticipated. Therefore, such statements are not intended to be a guarantee of our performance in future periods. Such forward-looking statements can generally be identified by our use of forward-looking terminology such as “will,” “expect,” “intend,” “anticipate,” “should,” “believe,” “scheduled,” or other similar words. Readers are cautioned not to place undue reliance on these forward-looking statements, which speak only as of the date of this press release. We make no representations or warranties (express or implied) about the accuracy of any such forward-looking statements contained in this press release, and we do not intend to publicly update or revise any forward-looking statements, whether as a result of new information, future events, or otherwise. Any such forward-looking statements are subject to risks, uncertainties, and other factors and are based on a number of assumptions involving judgments with respect to, among other things, future economic, competitive, and market conditions, as well as the continued viability of our joint venture partners, all of which are difficult or impossible to predict accurately. To the extent that our assumptions differ from actual conditions, our ability to accurately anticipate results expressed in such forward-looking statements, including our ability to generate positive cash flow from operations, make distributions to stockholders, and maintain the value of our real estate properties, may be significantly hindered. See Item 1A in the Company’s most recently filed Annual Report on Form 10-K for the year ended December 31, 2017, for a discussion of some of the risks and uncertainties that could cause actual results to differ materially from those presented in our forward-looking statements. The risk factors described in our Annual Report are not the only ones we face, but do represent those risks and uncertainties that we believe are material to us. Additional risks and uncertainties not currently known to us or that we currently deem immaterial may also harm our business. for Columbia Property Trust, Inc.